Serious, intense, powerful, and stockily built, they stand and deliver from the spot, packing their shots with menacing speed, pin-point accuracy, and a fair bit of guile that renders the best defences ineffective. As the hurtling ball evades the advancing runner, beats the outstretched arms of the hapless custodian, and sets the galleries alight, their individual prowess can often make all the difference in games that are balanced on a razor edge. The best in the business relish the big stage - ask Aussie master Chris Ciriello who loved firing them in sets of three's to sink the Dutch in the 2014 World Cup final and dash Indian hopes in the Commonwealth Games final the same year. While Ciriello's pupil Harmanpreet Singh is fast taking rapid strides towards emulating his Analytical Coach, the Golden Girls too have just the cutting edge they need to earn a fearful reputation and close in on the top-ranked sides. Much like Harmanpreet, Gurjit Kaur rarely smiles on the pitch - she goes about her business in a thorough and competent manner, shouldering the enormous responsibility of being India's principal drag-flicker. She powered her side to glory at the Kakamigahara Asia Cup in 2017 and by the time Sjoerd Marijne's team took on their continental rivals at Jakarta last year, Gurjit Kaur had developed quite a fearsome reputation. In the Asian Games semifinal against China, the Indians seemed to be running out of options and ideas in the nail-biting final quarter. 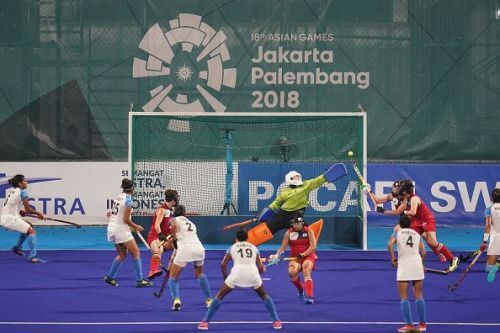 With both sides unable to break the deadlock - and Navjot Kaur missing the mark by a whisker - the match seemed to be heading for a fateful shootout when India won a PC with eight minutes left on the clock. The ball entered the net just after the whistle had been blown for obstruction - but the Indians earned another short corner which Gurjit struck hard and high to the top corner of the net to propel India to the finals. "It was a team goal - but it was extremely satisfying to have scored it," says the lady herself as she reminisces the moment. "I had to play the final in spite of the pain"
Not many are aware that Gurjit was not fully fit before the Jakarta final but was determined to take the field in spite of a bad knee. "I had to play the match in spite of the pain - it was the final - we had to win, and I told myself I would play no matter what. We earned only one PC in the final and could not score because of a bit of miscommunication between us," said the 24-year-old with an air of despondency. Yet, there is still loads to play for as the Indians prepare to march on to Tokyo 2020, as Gurjit Kaur explained, in an exclusive chat to Sportskeeda before Women's Day. After having recently been conferred the Sportswoman of the Year Award by an Indian sports magazine, Gurjit is upbeat about her team's prospects this year and is particularly pleased that the Indian eves managed to avenge their World Cup quarterfinal defeat. "We had to get past the Irish"
"The match against Ireland was not one that we were prepared to lose. The girls had made up their minds that, come what may, we had to get past the Irish which we did. It felt great." The World Cup silver-medalists who leapfrogged India to be placed one slot ahead of the Golden Girls in the FIH World rankings were outplayed by a 0-3 margin in the last match of the Spain tour, but the hosts too were in for a surprise. "We toured Spain before the World Cup last year as well, but we did not know much about them then. This time around, we were better prepared," said Gurjit with pride as she recalled the manner in which her teammates leveled the series against a Spanish side which won bronze at London 2018. "We adhered to the instructions of the coach and the followed the game plan - the results are obvious", says the Amritsar girl whose skills were honed by ace drag-flicking coach Toon Siepman. A drag-flicker can barely ever afford to rest on her laurels as every hit and variation is studied and scrutinized by opposition coaches around the world - so how does Gurjit keep evolving her skills? "I mixed up my flicks quite a bit during the Asian Games and World Cup - I tried the right-top corner, left-top corner, and went flat too. I always note the movements of goalkeepers very closely during video sessions to see the steps they take and which way they usually go, keeping in mind their runners and the defensive formation." Humble as ever, Gurjit is frank enough to admit that she needs to improve her fitness levels as she has not been at her best, of late, and hone her defensive skills as well. "I have to be fitter before we begin the matches for the Olympic qualifiers. My fitness has not been particularly good recently and it is my aim to correct that. I want to hone my defensive skills as well." "Our aim is to qualify for the Olympics and we will not spare any effort towards achieving our goal." Hailing from a remote village near the Pakistan border with hardly any sports facilities, a young girl dared to dream big and helped raise the standards of Indian women's hockey to a level hitherto unimaginable - can she refine her skills even further to be counted amongst the very best? "Gurjit is a world-class drag-flicker, and she knows it too," says coach Sjoerd Marijne describing his protege - indeed the sky seems to be the limit for this gritty and resolute athlete who is intent on going the distance.